Did you know the technicians at A Plus Door Services can help you fix many common garage door operator issues over the phone? Feel free to give us a call for help if you're experiencing difficulties with your operator! We've also assembled some useful tips and tricks to help you out when your garage door is not cooperating. If you hold in the wall station you can override your safety eyes and the door will come down. Q: What should I do if my power goes out and my car is stuck in the garage? A: The cord hanging from the track is your manual release. Q: Why won't my door open with the car remote? A: First, check the batteries in your remote. If the batteries are OK, the wall station could be locked or the antenna may be disabled. Q: My door will only open a couple of feet, then close. What's wrong with it? A: You may have a broken spring on your door. Q: My door will not close. What's wrong with it? A: The safety eyes may be misaligned (check for lights). Q: How do I measure for a replacement garage door? A: In addition to the width and height of your garage door, measurements for headroom, backroom, left side and right side are necessary. Measure the opening of your garage at its widest points. This will give you the height and width of your door. Next, measure from both sides of the opening to the left and right walls of your garage. 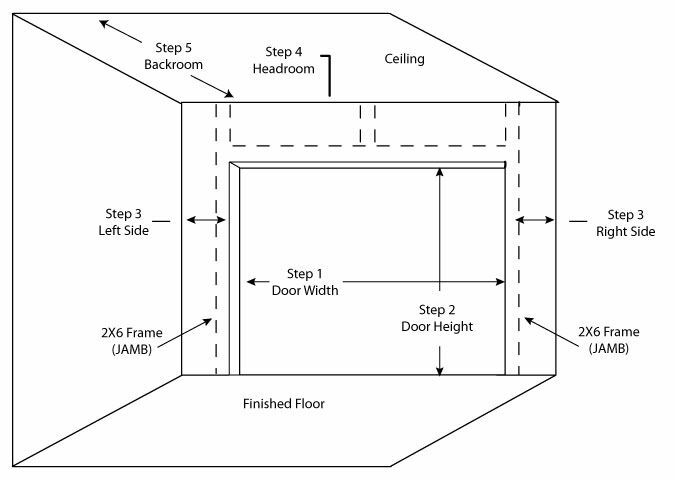 This measurement is necessary to ensure that there is ample room for your new door's tracks. After that, measure the distance between the top of your garage door opening and the ceiling of your garage to obtain your headroom. Finally, determine your backroom by measuring from your garage opening to the back of your garage.